I am one of those people who can’t have a simply plain notebook. I need to have it personalised, to show a bit of character. For book covers I like them to be covers in a mosaic style. Like below. When I was younger, that involved printing pictures off the Internet, or cutting them out of magazines. Gluing them onto my book cover. 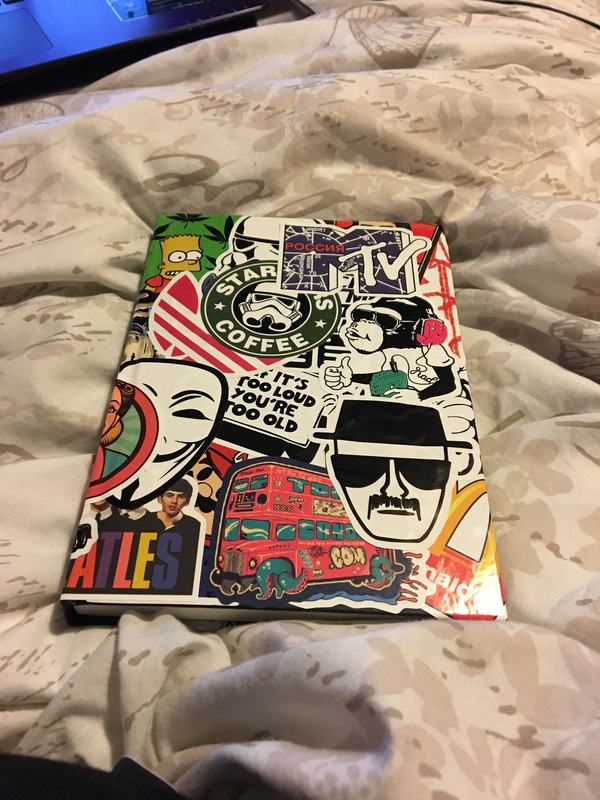 I was feeling a bit bored with my most recent diary, so I ordered stickers off Amazon, and spent a wee bit of time, covering my book. It was really fun and relaxing. Something I am needing to do more of. And it is something very simple. This entry was posted in 2017, ramblings and tagged art, collage, cover, creative, notebook, stickers. Bookmark the permalink.